Saracens director of rugby Mark McCall says his side can still improve despite securing back-to-back European titles. 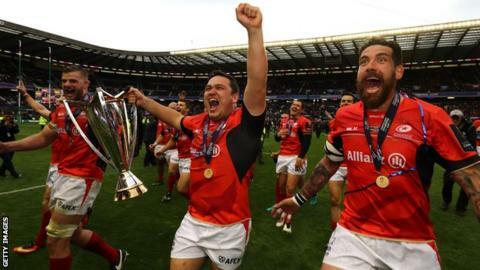 Sarries beat Clermont Auvergne 28-17 at Murrayfield on Saturday to remain on course for an historic 'double-double' of continental and English crowns. Their quest continues with a trip to Exeter in the first of next Saturday's Premiership semi-finals. "If we're hungry enough and humble enough, then there's no reason why we can't get better," McCall said. "The age profile of the group is good and the manner in which we won was encouraging." If they overcome Exeter next Saturday, Saracens will face either Wasps or Leicester in the Premiership final at Twickenham on Saturday 27 May. Saracens winger Chris Ashton opened the scoring in the 13th minute with his 37th try in the competition, setting a new European cup try-scoring record in the process. He raced on to Alex Goode's precise grubber kick for his historic try, and was quick to praise his team-mates when asked about the record. "I won't lie, I'm pretty happy about it," he said. "But I think a lot of it is down to the group I've been playing with the last five years. "It's nice for my name to be up there but a lot of the credit belongs to this club." The former England winger ends his five years at Saracens in the summer to join French Top 14 side Toulon, and he confessed to feeling sad about his departure. "I am going to miss it. I've had five amazing years here," he said. "I've had unbelievable highs and definitely some lows along there. "The support I've had from the players and the coaching staff has been phenomenal, so it will be a sad day when I do leave." Goode scored the try which all but secured Saracens' second European crown and has shone again on the European stage this season. The 28-year-old - like Ashton - has been overlooked by England, with the last of his 21 caps coming in a rare start as full-back against Fiji in 2016. But last season's Premiership player of the season is enjoying club rugby. "We have a young squad and one that is very hungry to keep improving," he said. "It was a joy to be on the field with the rest of the team. "The strength of the group is that we are constantly looking to improve and get better and we never feel like we are the finished article."